Note: This book will be on sale starting October 2, 2018. Mylo hasn't ever thought Martians existed. His best friend Dibs is a Mars fanatic, though. He's constantly telling Mylo that Martians are real, and Mylo doesn't believe him… until something crash-lands near his home in Roswell, New Mexico, during a storm. Shortly after, Mylo begins to hear voices in his head, begging for help. Most people believe it is just a weather balloon; at least, this is what the news reports are telling people. So people don’t really bother investigating that hard. However, Mylo and Dibs are sure it's a Martian spaceship, and they're proved right when they investigate the crash. They feel electricity in the air. They see a huge burned-out area. They find pieces of what looks like it came from a ship of some kind. Then, they see the ship itself! The boys come back later, this time with Mylo's crush Gracie. This time, Mylo climbs inside the ship, and that's when he sees it: the Martian. And it's alive. Dibs and Gracie are freaked out, and they drag Mylo off the ship. They become even more freaked out when the Air Force shows up and takes the ship, with the alien still on board. The three kids, hiding, witness the whole thing. Mylo suddenly realizes that he must have accidentally dropped something on the ship as his friends were dragging him out. Something very special to him. Something that he has kept to remind him of his recently deceased older brother – a small teddy bear, small enough for Mylo to keep in the front pocket of his overalls. When he realizes that the memento is gone, he leaps on his horse (it’s 1947, and they are in New Mexico), and rides away, streaming tears. He rides to his brother’s grave to apologize to his brother. But while he is at his brother’s grave, he realizes that someone… something… has followed him to the graveyard. And brought him back his bear. What follows is an exciting quest to return the kidnapped Martian to its home while dodging the Air Force, keeping some very deep secrets, dealing with painful memories of a lost loved one, and learning more about the universe and himself than Mylo ever thought possible. The Truth about Martians isn't just a sci-fi story about aliens. It's also about the determination of friends and family that drives them to help each other. And of finding new friends in the most unexpected places. Personally, I thought the book was amazing. There were parts where I laughed, and parts where I almost cried. There were parts where a character made me cringe, and parts that left me shocked. And I'll recommend it for boys or girls, ages 8+. It is about 300 pages long, but it didn't feel that long. So, go buy it... when it comes out. 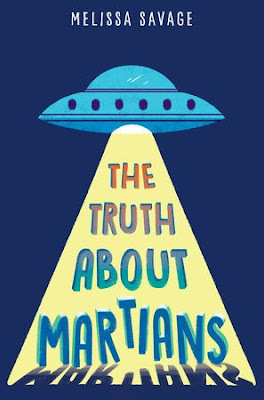 The Truth about Martians isn't going to be on sale until Oct. 2, 2018. I got my hands on an advance reader's copy, and now I am sharing my thoughts with you! You can find out more about the author, Melissa Savage, by visiting her website here. Or follow her on Twitter at @melissadsavage. Daddy's afterthoughts: I really liked this book too. The story is cute, and could/should probably make a pretty decent movie if someone ever buys the rights. (Yes, the story has shades of E.T. and Earth to Echo, and even Short Circuit in it, but that is not a bad thing.) What I really loved about the book was Savage's dogged determination to place the action squarely in 1947. She accomplishes this by following in the footsteps of Junot Díaz's The Brief, Wondrous Life of Oscar Wao and more recently, Ernest Cline's Ready Player One, and liberally peppering her prose with 1940s-era pop-culture references: Superman (the rooster that crows to wake Mylo up is named "Jor-El McRoostershire the Third"), the New York Yankees, The Wizard of Oz, and a variety of references to various candy and food items that would have been popular at the time. A note to religious parents: The young protagonist, Mylo, initially has a somewhat fractious relationship with that entity most simply refer to as "God." He speaks honestly and openly, as any kid who just lost his older brother might. There is nothing scandalous or blasphemous (not that I personally would mind), just a child working out his feelings the best he can. Every generation has its YA titles that deal with these themes; for me growing up in the 70s and early 80s, it was Are You There God, It's Me, Margaret by Judy Blume. (This book should not register anywhere near that level of controversy!) And for what it's worth, Mylo's attitude does not stay that way throughout the whole book. I think parents who are worried about such things, if they choose to read the whole book, will find themselves both pleased and relieved at the course of Mylo's "spiritual" journey.